You are here: Home » Everything Else » Other » Booking Through Thursday – Book Gluttony! Booking Through Thursday – Book Gluttony! Book Gluttony! Are your eyes bigger than your book belly? Do you have a habit of buying up books far quicker than you could possibly read them? Have you had to curb your book buying habits until you can catch up with yourself? Or are you a controlled buyer, only purchasing books when you have run out of things to read? …..over 100 here, stacked very precariously! Apart from the 5000+ books I have for book business, I also have another couple of hundred books in the garage, which although aren’t technically in my TBR pile often migrate into it! On the positive side I am very disciplined when buying new books, especially hardbacks. If I splash out on a newly released book then I am very good at reading it straight away, and then selling it on as quickly as possible, so I don’t lose much (any) money on it. For example, I have already sold my copied of The Thing Around Your Neck, Little Stranger and Burnt Shadows, which I read earlier in the month. My TBR pile consists almost entirely of books bought second hand, whenever I happen to come across a book I’d like to read cheaply. It is expanding much faster than I can ever read them, normally at a rate of 5 – 10 books a week. 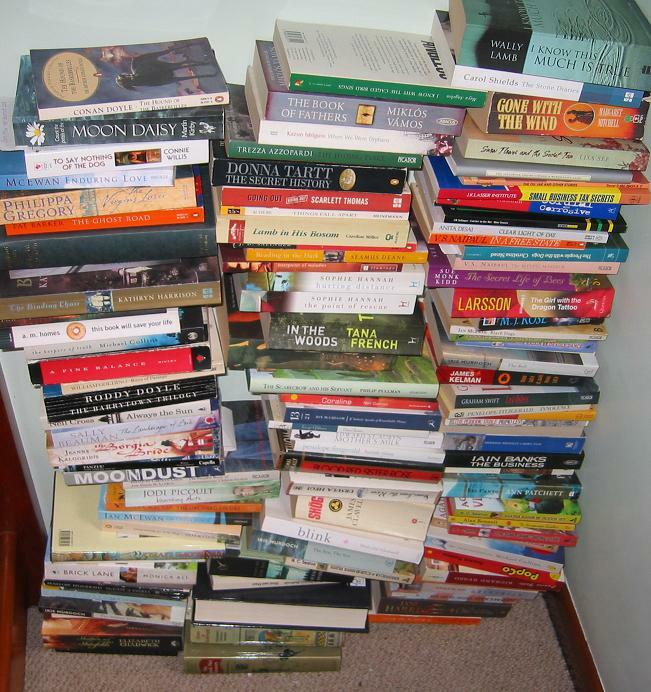 Does your TBR pile look anything like mine? How quickly is your TBR pile expanding? Do you see any books in my TBR pile that need to be read immediately? Or any that need to be culled? This was a great post. I am out of control at times, but almost never will pay full price for books. (I’ll take photos later of my stacks. last April when I moved house. I do buy 10-12 books a month but I also giveaway the same number. To orpanages, children’s homes, Old-age homes, charities etc etc. Today I gaveaway 56 books to the ttiny library in our apartment blocks. Man, were they pleased?! In a way buying ang giving away goes hand in hand. Diane – I look forward to seeing your photos. gautami tripathy – I give away loads of books too, once I’ve read them. It is normally about 50 -100 books a month (large because I get a lot through my business)I’m well known at all the charity shops + jumble sales around here! The pile up there is just books I haven’t read (+ about 10 keepers) I very rarely keep any book I’ve read, so there is a fair flow of books through the house, even if the number is slowly rising! LOL – I don’t feel quite so bad about my tbr pile anymore! Wow. That’s an impressive pile. I have one almost just like it! I have to sneak them into the house and slyly put them on the bookshelf and hope he won’t notice. BUT I am trying not to buy too many now and so I mainly get library books now. While I do enjoy reading the responses to this fantastic prompt — I am in awe looking at the pictures! I just drool over all those lovely books just waiting for their moment to shine. There is something about being surrounded by books that invites peace and tranquility. Until I began blogging I didn´t even know one had to have a huge TBR. But from no books I have built up a pile of 20 unread books. Okay, laugh, but 20 books is better than none. I also buy several of my books second-hand via the internet, but the postage in Denmark is so expensive that it may be cheaper for me to order 3-4 new Swedish paperbacks at the time and have them sent to Denmark. Odd, but true. You have a wonderful problem and I don’t feel sorry for you. Rather I’m envious of some of those piles. Great pictures. JoAnn – In the book blogging world I’m sure it is only a matter of time before the books start taking over! Suey – I’d love to see a photo of yours. It is so interesting to see which books people have waiting to be read. Carole – My oldest son now says ‘mummy has too many books’ and he’s only 3! My husband just accepts that book buying is one of my flaws he has to put up with! Molly – I think the books need to be well displayed to invite peace and tranquility – leather bound ones in old librabries do it for me! I do love having so many books though. Dorte – I think if I had to buy all my books over the Internet, or full price in shops then I’d have next to no TBR pile. The only reason I have so many is that I find them all really cheaply, and when a book I want to read is 50p or less I can’t say no! Margot – I wouldn’t waste any sympathy on me! Maybe spare a little for my husband, but really there are many more problems in the world than having a few too many books!! lol!! Based on your piles, it looks like you have tons of great reads ahead of you. I was happy to see you have In The Woods by Tana French – I read that earlier this year (as well as her second novel, The Likeness) and enjoyed it a great deal! Also, you’ll need to read Part One of 2666 for the read-along by the end of the month! What a great post! How often do you keep a book once you’ve read it? Sometimes if I finished a book and didn’t really care for it, I’ll keep it to read it again later. I think my pile usually expand by one or two every month. It usually depends on what just came out and my PBS account wish list. Steph – I’ve heard very mixed reports of In the Woods, so it isn’t near the top of the pile at the moment. I do tend to literally move books around, so you can tell from the photos which ones are going to be read next – note Home and Wilderness in the prime positions!! 2666 is near the top of the pile. It is about 5th on the list. I’m really going to try to read it before the end of the month, but I have a feeling it is going to fall into June. Vasilly – I very rarely keep books once I’ve read them. I don’t normally re-read books and so the only reason I keep them is to lend to friends. I probably only have about 10 books which I’ve read (other than cookbooks and other non-fiction) perhaps if my friends were bigger readers I’d keep a few more. OH my gracious! I thought I was bad… you’ve got me beat by a mile. However, my TBR pile is mostly located at GoodReads rather than in my home. I try to get books via the library as much as possible. DebD – I also have a wishlist of about 200 books on bookmooch/Amazon that I don’t own yet! I’m terrible at getting to the library to return books, so it is normally much easier for me to pick up cheap copies when I come across them – as my job is book sourcing I come across quite a lot – you’d probably be amazed at how many don’t make it into my TBR pile! 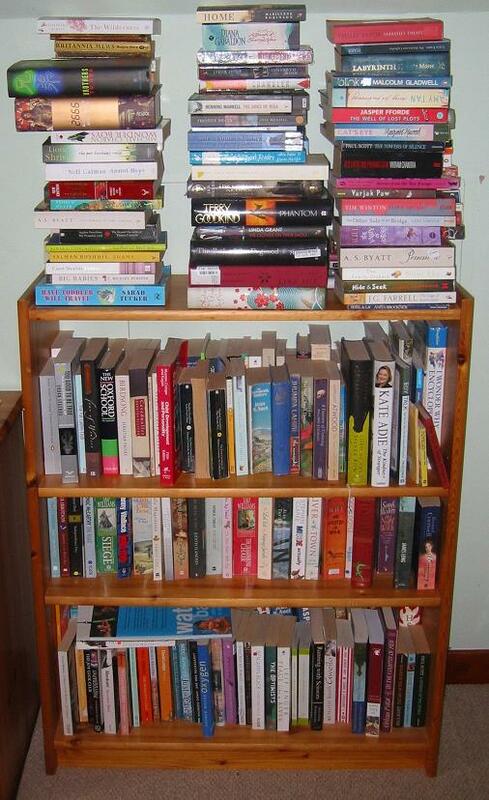 Love the picture of your books stacked up like Junga! Way cool! Proud to be one, but I try not to buy. I grab the ones that I’m most desperate to read and leave the rest on a list. My pile looks exactly like yours. I suppose if I stopped reading book blogs I might be able to catch up. Thank you for sharing your amazing TBR pile photos Jackie! I thought my piles were out of control but I am thinking you may be a little ahead of me!! I am definitely a book glutton but it is the only thing in my life (well, maybe shoes as well!) that I do go overboard in so I try not to make myself feel too bad about it! Matthew – I’m not sure it’s cool – but thanks! At least they haven’t toppled over yet! Candy – I blame book blogs too! I have always bought bargain books when I see something I want to read, but thanks to book blogs the list of books I want to read has increased exponentially. I see more than a few really wonderful reads on your pile. Shogun., Gone with the Wind, the Larssen, The Secret History. You have lots to look forward to. Oh my word, that’s a LOT of books. I don’t see any books you should read right away at a cursory glance — other than Gone with the Wind, which you have — but I do think you should buy more bookcases. Pronto. Good question! We should all do this and get advice on which are truly the must-reads. In the Woods! Dig it out and start it right away. Oh my goodness! Look at all the books. I have about 600 and they are all over the place in my small apartment, and I just keep getting mre and more of them faster than I can possible read them. That’s the most beautiful thing I’ve seen all day. Candy – I’ve never seen Shogun mentioned in the blogging world. It has always appealed to me, but it’s length is very offputting – thank you for the recommendation. I’ll try to move it up the list. Christina – Yes, Gone with the Wind is one of the few keepers. The problem is that space is too small for a book shelf. I did see Simon had some nice boxes though – I’m thinking of getting a few for the wobbly stack! Jessica – Thank you for commenting on my blog for the first time! Another vote for In the Woods…I’m really not sure….perhaps I should give it a try to find out for myself. Nicole – Books are more addictive than most people could ever imagine aren’t they?! Fantastic TBR pile, Jackie, I’m proud of you! Mine isn’t quite that big, but, very close. I spotted a book you HAVE to push up to the top of the pile – “Gweilo” by Martin Booth. Now I am biased about this because I live in Hong Kong, which is where Booth’s memoir is set and it may be that knowing a lot of the landmarks he mentions, as I do, makes the book all the more familiar and an easier read, but, it is a great tale of childhood adventure which is written with such clarity of memory, you could almost be in Hong Kong in the 1950’s – I know this to be so because some of the things he describes are still around today in the back streets of Kowloon and in country villages where tourists seldom visit. I reviewed it on my blog on April 19th if you want to check that out first…..
Kim – No one has ever recommended Gweilo before – it is just something I saw at a car boot sale one day, and thought it looked interesting. I’ll have to move it up the pile a bit. I have read The Kindness of Strangers – quite a while ago actually, so I can’t remember much about it. I think it was quite good. I’m keeping it, as I think my husband wants to read it at some point. I have 3 double shelved bookshelves full of unread books. I could skip buying for quite a while and not run out of reading material. My TBR is quite like yours, complete with falling pile. Tho, in my defense, the falling pile are the ones I just culled out to trade/sell as I’m not realistically going to get them all read. I love these pictures I have been going through them and seeing which ones I have read and which ones I am yet to read and which ones I now might have to get! Wonderful pictures. I suddenly don’t feel so guilty about my stack numbering around 220! I love it. Absolutely love it. I also love that you mentioned a car boot sale, which is so uniquely British! Heather – Car boot sales are great – they really should be introduced globally! Oh I don’t know what it is, but I LOVE seeing other people’s book piles! Thanks for showing off yours, and good luck making headway into that lot!